Our travel agency in Coron booked us in R2R Bayview Inn. While we had no complaints about the inn’s location and restaurant menu, the room given us was musty and dated. We could have ignored these but the room also lacked proper window locks, closet, and bed. We paid P8,300 for our 4D/3N tour package, so in my estimate, the room rate was at P1,200/night. It was not worth it but instead of complaining to the owner of the inn, we decided to look for a better place to stay. 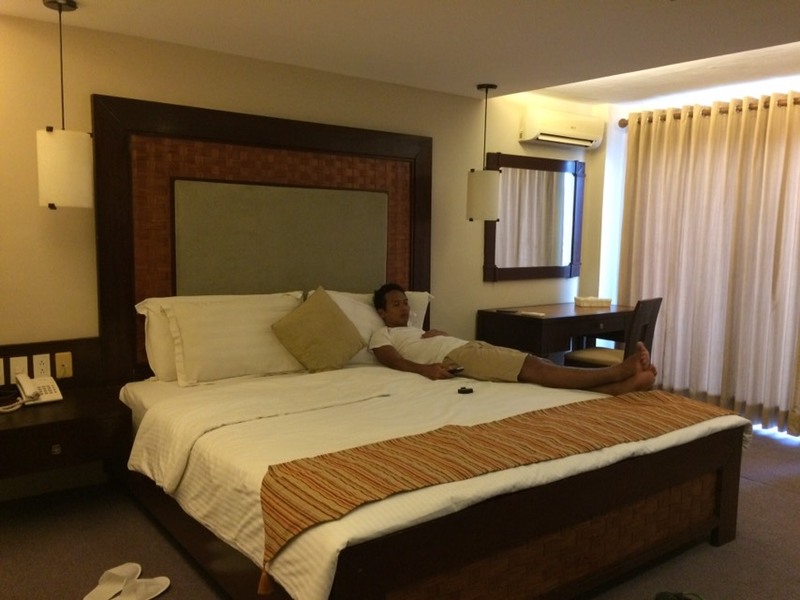 We chose to spend our last two last days in Coron at Coron Gateway Hotel and Suites. Here’s the review of the property by the harbor. 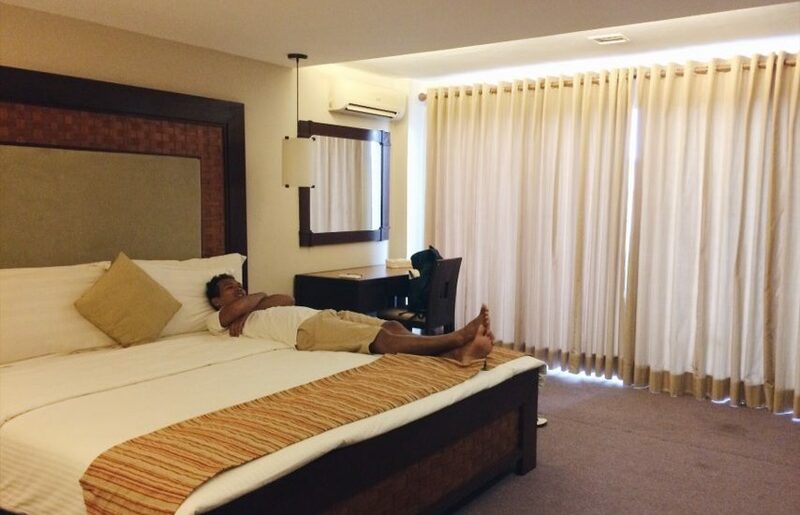 The standard guestroom at Coron Gateway Hotel and Suites was far more luxurious than our room at R2R Bayview Inn. But it doesn’t make sense to compare them since they are not in the same price range. The Pros: cheap rate for a 3-star hotel, ginormous room and great location. The Cons: improperly installed carpet, stained bathtub and pricey so-so breakfast. You will find a better deal if you book ahead of time at this hotel. In our case, it was not an option. After a visit at Lualhati Park, we stopped by the hotel’s reception area (which is on the second floor). I asked the receptionist if we could view the room before we booked. He happily obliged to show us to our room-to-be. After a few minutes of inspection, Neil and I agreed to stay here for one night and paid for through our debit card. I was a little surprised that the property only had 31 rooms but after the front desk officer showed us around, I imagined that the more expensive suites were so much bigger than our standard room. At night, the hotel building stood out with its lighting, size and waterfront location. The lobby, however, had a small seating area but had no lavish decoration and with little space to walk around. Some paintings were hanging on the wall. The reception desk was small with minimal decor. The front-desk officer was friendly and efficient. When I first walked into our room, I was amazed by how huge it was. Aside from the plush sofa, the room also had a closet and luggage rack to put our things down. According to the hotel, the room is about 40 m² or 430 square feet, and ours came with a massive, comfortable and extra-long queen-size bed, flanked by night stands with drawers and warm lighting from hanging bedside lamps. Much to Neil’s delight, cable channels were available on the flat-screen TV across the bed. Beside the window, there was a dresser with a mirror and a chair. My craving for complete relaxation and Zen completely sated. Neil went to dreamland ahead of me. The bathroom was vast, with a shower-bath, perfect for guests who want both options available. 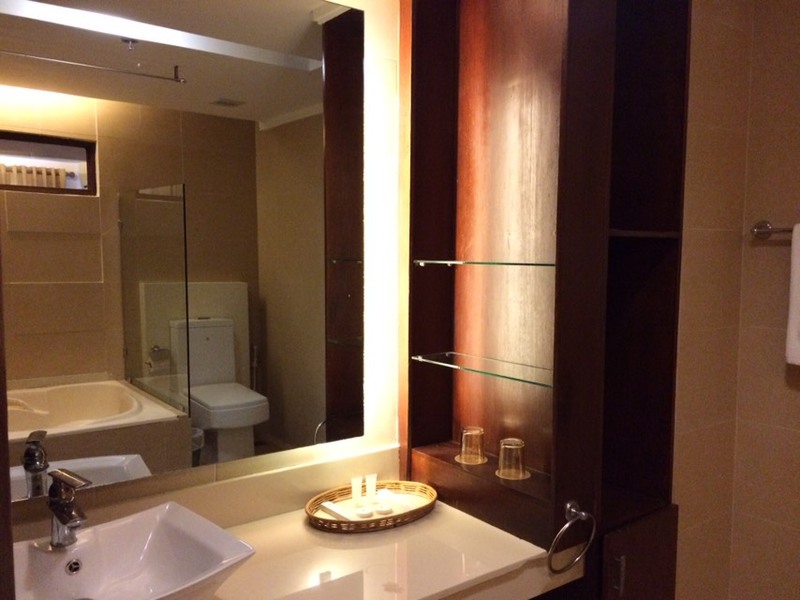 Across this was a wide mirror with a spacious vanity top to put your own toiletries. Hotel-branded towels and toiletries are available for use. The toilet and bathing area were separated by a glass divider. We checked in after our full day island hopping tour so we were too tired to explore other amenities in the hotel. Upon checking later, there was nothing much to explore except for the hotel’s massage and laundry services. We did not have a bed and breakfast booking so we had to pay for our breakfast at the restaurant attached to the property. (The previous night, we were here searching for champagne to celebrate Jewel’s birthday.) 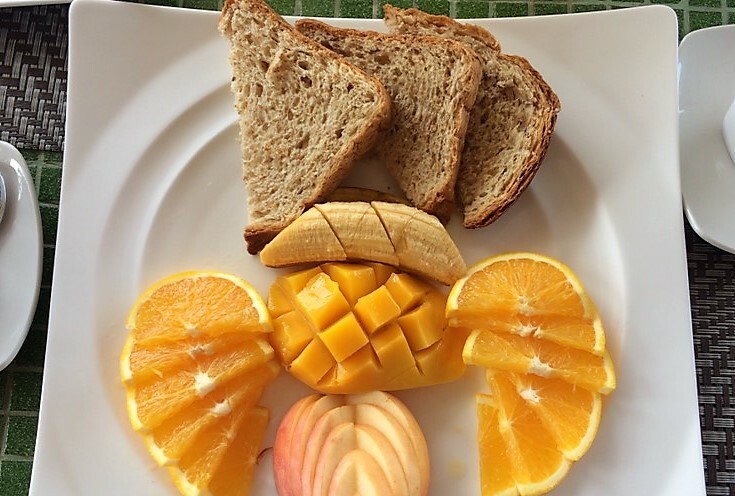 Breakfast was meager and tasted bland. Coron Gateway Hotel and Suites must have looked grand back in its heydey. Families and couples will enjoy the spacious suites with tasteful interior design. The property, however, could really use an update. I won’t leave you without giving some tips, which I hope you’d find helpful. Be sure to mention that you want a room facing the sea. Ours had a view of the empty streets. Have you stayed in this hotel? What was your experience like? Share your stories in the comments below.